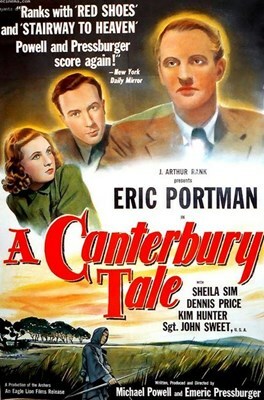 A Canterbury Tale is a profoundly personal journey to bucolic Kent, England. Set amid the tumult of the Second World War, yet with a rhythm as delicate as a lullaby, the film follows three modern-day incarnations of Chaucer’s pilgrims — a melancholy “landgirl,” a plainspoken American GI, and a resourceful British sergeant — who are waylaid in the English countryside en route to the mythical town and forced to solve a bizarre village crime. Building to a majestic climax that ranks as one of the filmmaking duo’s finest achievements, the dazzling A Canterbury Tale has acquired a following of devotees passionate enough to qualify as pilgrims themselves.